Nana Addo Dankwa Akufo-Addo, flagbearer of the New Patriotic Party (NPP), has observed that there had been several attempts in the past to deliberately wipe out the achievements of JB Danquah from the political history of Ghana. He said the intolerant stance in the politics of Ghana that characterized the early years led to a deliberate attempt to wipe out the significant role played by JB Danquah and others. Nana Addo, who was speaking in Accra at the launch of a book entitled, ‘Things Every Child of Ghana Should Know About Dr. JB Danquah,’ written by Abyna-Ansaa Adjei, said among the various achievements, Dr. Danquah did a research and came up with the idea of calling this country Ghana (hitherto known as The Gold Coast). 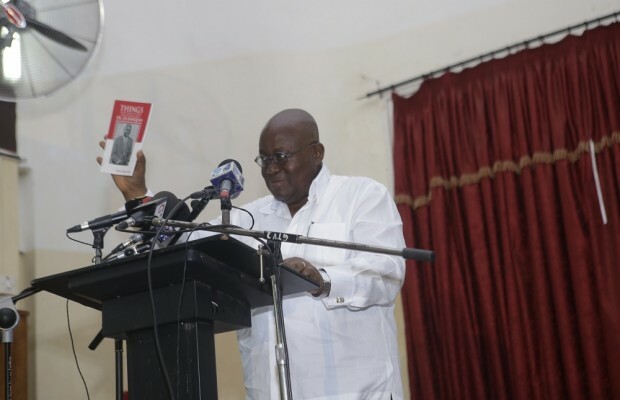 The launch of the 72-page book – edited by Elizabeth Ohene, a seasoned journalist – coincided with the 51st anniversary of the death of Dr. Joseph Boakye Danquah, known as the doyen of Ghana’s politics. The book, which is the 10th by the author, tells the story of Dr. Danquah’s life from his childhood, his years of academic excellence as a student in the United Kingdom, through his political career as a freedom fighter and politician until his death in the Nsawam Medium Security Prison on February 4, 1965. According to Nana Addo, the book brought back vivid memories of Dr. Danquah’s personality as a dynamic and charismatic individual who wrote profusely and was never shy of arguments. He also disclosed that though the book is meant for children, adults would also learn a lot from it and gain a better insight and impression of JB Danquah’s achievements. “Fifty-one years ago, JB Danquah died in the Nsawam Medium Security Prison under the most inconvenient conditions. So touting a figure was he that my proudest moment as a child was when he asked me to become Page-boy at his wedding to the love of his life, the beautiful Elizabeth of Sekondi. I am really astonished that Abyna has unearthed these pictures of me as a young child in this book which is meant for young children. This will be a remarkable testimony to our qualities of receipt because I never knew there was a record of that event,” Nana Akufo-Addo articulated. He added that by researching and putting together the book, the author had taken the argument away from the life history of JB Danquah to unearthing so many unknown and unacknowledged facts about the man. “The author backs up every statement about Danquah with evidence and does so in elegant simple prose,” he said. The NPP standard bearer bought 1,000 copies of the book to be stocked in the various public libraries across the country. Prof. Kumi Ansah-Koi, Political Science lecturer at the University of Ghana, Legon, reviewing the book, noted that the family of the late Dr JB Danquah are still victims of defamation and slander due to the problem of mass ignorance and illiteracy . He predicted that the book would go a long way to dispel the mass ignorance and illiteracy about Dr Danquah. Abyna-Ansaa Adjei, the author, said she was inspired to write the book after she had been tasked to design the brochure for the 50th anniversary of Dr JB Danquah’s demise last year. A good number of dignitaries and political bigwigs like Elizabeth Ohene, Freddie Blay, Ken Ofori-Atta, Alan Kyeremateng, Keli Gadzekpo, Samuel Atta Akyea and Osafo-Maafo among others, turned up for the event.